I've decided to make some of my favourite cartoon characters into the main cast of heroes for "Alien Terminators". These are just four of them, there are more to come. 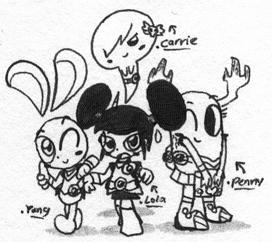 This story is that characters like Yang (from Yin Yang Yo), Lola (from Robotboy) and Penny & Carrie (from The Amazing World of Gumball) are all young members of S.P.D (Space Patrol Delta) on a special team codenamed the "Alien Terminators", a unit that deals with the alien treats that adults can't handle, with Lola being the newest recrult.